Construction of and improvements made to the state highway system require negotiations with various utility companies (including cities and railroads) for right of way, construction easements, and adjustments that may be required to their facilities to eliminate conflicts with the proposed highway improvement. These negotiations must also comply with MHTC policy. 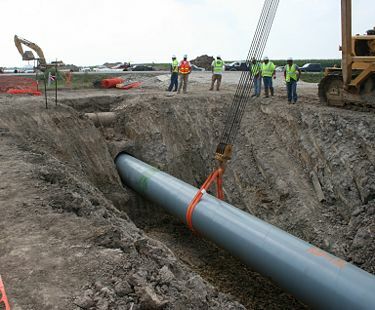 It is the responsibility of district personnel to negotiate with local utility companies, cross-state pipelines and other interstate utility facilities for right of way, easements, and adjustment agreements. Design personnel are readily available to assist with these negotiations. The District Utilities Engineer will write a Utility Status Letter for every project that requires the adjustment of utilities or requires a utility JSP to address special concerns or notice. This status will be provided to the Transportation Project Manager for inclusion with submittal of the final plans to Design. 5. Utility adjustments, plans and specifications, are included in the bid documents for the road project. A utility agreement (UT04) must be executed. Projects with “No Utility Impacts” no longer need a Utility Status Letter or Utility Status JSP. On the District Final Plans Submittal Form (Form D-12), under Project Details – "Utilities Involvement", select ”NO” and under Checklist Items – “Utility Status Letter”, select "NO". For guidance on acceptance of liability, refer to the Acceptance of Liability Policy at the Chief Counsels Office SharePoint page. This page was last modified on 24 July 2017, at 12:46.